Carpisa is an Italian brand specializing in quality accessories at affordable prices that offers many product-lines to suit all pockets and from which to choose the most appropriate gift. Leather products are normally more expensive than those in faux leather or fabric, but the whole collection always maintains an excellent quality / price ratio. Carpisa offers for this Valentine's Day a range of gift ideas for him and for her, low cost but guaranteed to make an impact. The Italian fashion brand presents a capsule-collection for Valentine's Day 2014 especially dedicated to couples in love. Made up of comfortable and practical accessories, the capsule-collection is full of nice gifts ideas at widely accessible prices. Carpisa Valentine's Day capsule-collection is full of nice gifts idea for her but also accessories for men, who usually have always tastes a bit 'more complicated than the ladies. So if you are short for ideas for him, definitely take a look at this collection. Right now, Carpisa Autumn- Winter 2013-2014 collection is available on sale, so if you have a chance do have a good browse around to see what is left: you may find some really good bargains, and probably get a much better present for your budget. Additionally, the new Spring-Summer 2014 collection is loaded with beautiful products, including leather bags, purses, wallets and pouches and available in dark green, Prussian blue, and black. 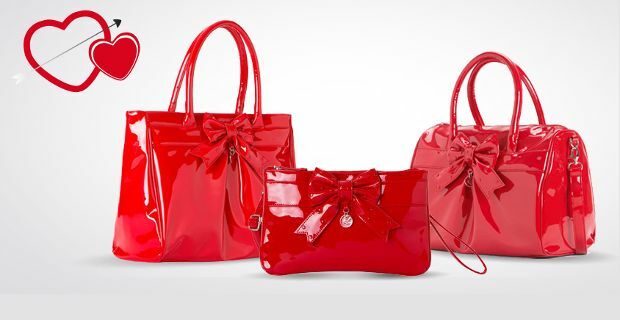 For the ladies, in its Valentine's Day themed capsule-collection Carpisa offers bags and clutches available in faux painted leather, in white and red and decorated with a beautiful bow. In the same line are also available faux leather products in simpler, less showy colours such as mat burgundy, definitely one of the coolest colours for the next season. Very nice also the line of bags decorated with charms and chains, elegant and refined, suitable for both everyday and special occasions.